With the support of Visit Wales & RTEF funding, the #RealMidWales campaign began in 2018 on Facebook & Instagram - and the #RealMidWales message continues. The campaign aims to attract more people aged 27-40 year to Mid Wales from within a 3-4 hour drive time, namely Bristol, Manchester, Birmingham, Liverpool and London. This is a fantastic opportunity for Mid Wales businesses to get behind a marketing direction for Mid Wales and one which we can all benefit from going forward. ​Lets work together and put Mid Wales on the map! ​There are a number of ways you can get involved in the project. The more people engage, the louder our message, so lets really make some noise. As part of this project we developed a visual signature. The signature can be used by all and is a template for taking distinctive Mid Wales photographs/video. 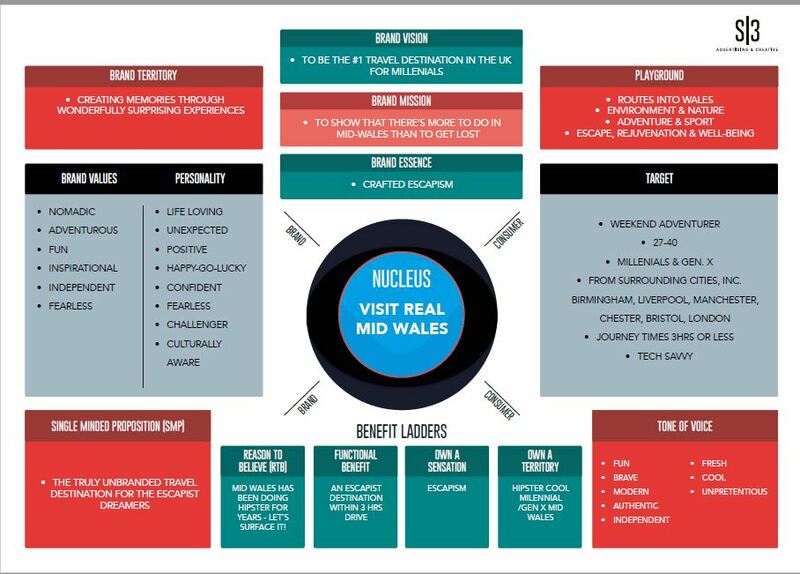 The style was developed by working with the Visit Wales marketing team to ensure that the Mid Wales signature compliments the 'Wales Brand', so by working together we can make a bigger impact online. ​The Brand Sun is a diagram which shows the concept and the ideas behind the project. This is a great illustration of the market we're targeting, what they're looking for and what we can provide. It also shows the tone of voice and brand vision we're aiming to project through this campaign. Twitter: try hashtagging locations or trending hashtags e.g. #ThrowbackThrusday, #FridayFeeling, #MidWales, #BankHoliday. Upon seeing #RealMidWales on their feed, users can click and find all posts featuring that hashtag! Also, when posting photos, try to make use of the option to tag up to ten people within that photo. Instagram: Hashtag as much as you can in the comments section of the post. Hashtagging in the comments not only allows your initial photo caption to look neater and more appealing to users, but also allows you to delete them as a comment at a later date. Also, posts with location tags on this platform receive up to 79% more engagement than those that don’t. Don’t forget to tag accounts in your photos, too! A few great go-to accounts are @VisitWales, @IgersCymru, @TheWalesCollective and @DiscoverCymru. Facebook: Due to this platform’s privacy settings, hashtags do not bring in as much engagement as on Twitter or Instagram. As a result, we recommend consistently using one or two hashtags that are used throughout your channels, for example #RealMidWales. If audiences can see you engage with your followers, they’re more likely to engage, too! See who engages on your posts – scroll back through your notifications on TW and IG and click on your users’ profiles. Engage with some of their content and they’ll most probably show some love back. However, be cautious of over-spamming with likes, as social platforms can often temporarily suspend your account when they see it happening. If someone comments on your post, take the time to reply and make a conversation. If they weren’t following you in the first instance, they more than likely will after you’ve taken the time to show an interest in them as an individual. Ask questions, appear interested and make it fun! Spending ten minutes a day to do the above can really make a big difference. Scroll through the explore page on Instagram and click on popular hashtags such as #VisitWales and #WalesNeverFails – you’ll find posts and pages you’ve never seen before! This will help you create loyal, mutually beneficial online relationships with similar brands. You’ll find they’ll tag you in photos, repost your content and engage frequently. Aim to do this with a brand that has a higher social following than you, as you’ll benefit more. When you’re building a social account, it’s good to have loyal relationships with users and the local community. It is important to build these relationships, so the account can benefit for engagement purposes. This includes independent local businesses and even local names, be it news presenters, sportsmen, and so on.